Super Eagles goalkeeper, Francis Uzoho, conceded three goals while in action for RC Deportivo Fabril in Saturday’s 3-1 home defeat to Celta Vigo B in the Spanish Segunda B Group 1, Primemedia.com.ng reports. Uzoho who was making his 22nd appearance for the club has now conceded 17 goals, and kept 12 clean sheets for RC Deportivo Fabril. Efe Ambrose helped his Scottish League side, Hibernian FC record a 2-1 win over Celtic in the Scottish Premier League at Easter Road on Saturday. The defeat delayed Celtic’s title triumph. The win was the first for the Hibs over Celtic since December 2012, and it was the third time that Brendan Rodgers’ side has lost in the league this season. 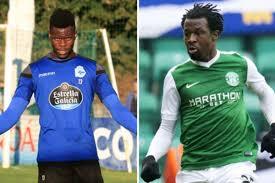 Ambrose has made 34 SPL appearances for the Hibs this season. In Turkey, Shehu Abdulahi made his 12th appearance for Bursaspor in their 4-1 away win at Karabukspor. The Nigeria international was yellow carded in the 72nd minute of the ill-tempered encounter that saw seven yellow cards and a red card issued. His compatriots, William Troost Ekong and Mikel Agu were unused substitutes in the encounter. It was the second game in a row that the pair were left out of the starting lineup. William Troost Ekong has made 25 appearances for the club scoring twice while Mikel Agu has 22 games under his belt scoring twice as well. Ogenyi Onazi was not included in Trabzonspor’s side that lost 2-0 at home to Sivasspor. Onazi has made 18 league appearances for Trabzonspor this term. Sammy Ameobi played all 90 minutes for Bolton Wanderers who slumped to a 4-0 defeat at home to English Premier League bound side, Wolverhampton Wanderers. The game was Ameobi’s 33rd of the season. Bolton remains two points clear of the relegation zone, in 21st position, with 40 points from 44 games. Ola Aina played for 44 minutes before he was replaced by Fikayo Tomori in Hull City’s 5-5 draw with Bristol City. The game was Aina’s 44th appearance this season for Hull in the English Championship.